IDF Chief of Staff submits defense report to Knesset Foreign Affairs and Defense Committee on IDF's readiness for war. 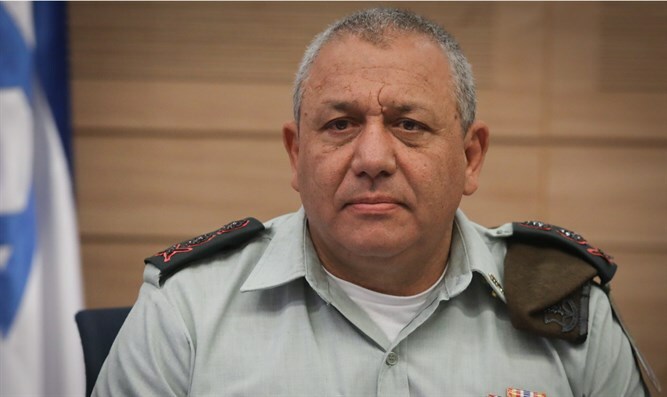 IDF Chief of Staff Gadi Eizenkot recently submitted his annual report on the readiness and fitness of the IDF forces to the political echelon. The report is complex and details the IDF's overall level of fitness and the ability of each of the IDF's divisions to fight. It was signed by the generals of the General Staff. The document, classified as "extremely confidential," is submitted annually to the Prime Minister, the Minister of Defense, the members of the Political Security Cabinet and the members of the Knesset Foreign Affairs and Defense Committee. Over the last year, Israel took significant action to prevent Iran from entrenching itself militarily in Syria. Following pressure on Iran and in accordance with an agreement between Israel and Russia, Iranian forces were moved back to a position no closer than 50 miles from the border with Israel. In addition, the IDF has admitted that it has carried out about 200 strikes in Syria over the last 18 months. The report also deals with the southern sector. Intelligence sources in the defense establishment know that both Abra Mengistu and Hisham a-Sayid, Israeli civilians who have been held in the Gaza Strip, are alive. The army's position is that everything possible must be done to bring the two fallen IDFoldiers, Hadar Goldin and Oron Shaul, back to Israel. At the same time, the effort to locate terror tunnels continues. Fifteen tunnels have been identified so far, and a a third of the new barrier built around the Gaza Strip has been completed. The IDF was asked by the political echelon to maintain security stability in the south, to demilitarize the Gaza Strip and to establish a moderate government in Gaza - a long-term goal to which it is trying to reach. In a letter the chief of staff attached to the document, he stressed: "The IDF is in a state of readiness for war in relation to every scenario of threat and attribution." "As the person responsible for the army's preparedness for war, I state that the IDF is ready and prepared for any mission required of it. It is an army with intelligence and air superiority, ground capability and rich operational experience that is tested daily in every arena of war," Eizenkot said. Eizenkot drew attention to issues facing the IDF, noting that "the army's numbers will always be lacking. There are gaps and they are taking place alongside risk management and priorities. The commanders have the duty to adapt the process of building the force to maintain the quality and supremacy of the IDF in the present and to take advantage of the window of opportunity IDF to the challenges of the future "
"More work needs to be done in the area of optimal operational readiness, but on the other hand, the IDF is stronger and more prepared than it has ever been for any other scenario or threat," Eizenkot concluded.